Colin Campbell Cooper (1856–1937), New York from Brooklyn (c 1910), oil on board, 63.5 x 76.2 cm, Jersey City Museum, New Jersey, NJ. Wikimedia Commons. Colin Campbell Cooper (1856–1937) was the right painter in the right place at the right time. 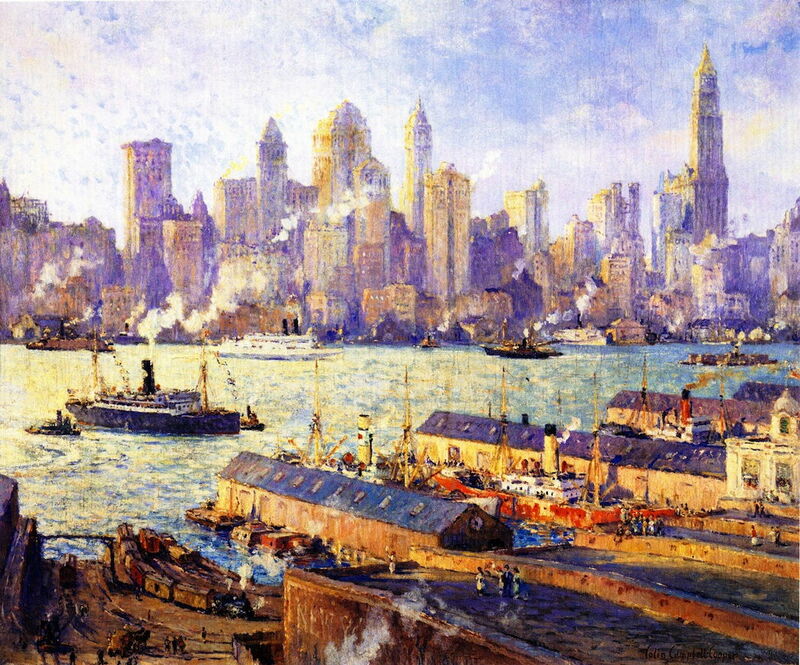 An Impressionist with extensive training and experience painting in Europe, he was working in New York at the time that its skyline was starting to become dominated by skyscrapers. Whenever you see evocative photos of tall buildings, or shots of them in movies, remember that it was Cooper who first really explored their aesthetic appeal. He was born in Philadelphia, PA, into a professional, Anglo-Irish family, and was first inspired to paint when he visited the Philadelphia Exposition in 1876. He started his studies under Thomas Eakins at the Pennsylvania Academy of Fine Arts, then in 1886 travelled to Europe, where he studied at the Académie Julian in Paris until 1890. Among his teachers there were Bouguereau and Lefebvre. His initial realist style became influenced by the Barbizon School over that time, and his early works were in the main landscapes. He returned to Philadelphia in 1895, and taught watercolours at the precursor to what is now Drexel University until 1898. Tragically a fire in the Hazeltine Galleries destroyed many of the best of his earlier works, leaving few survivors today. 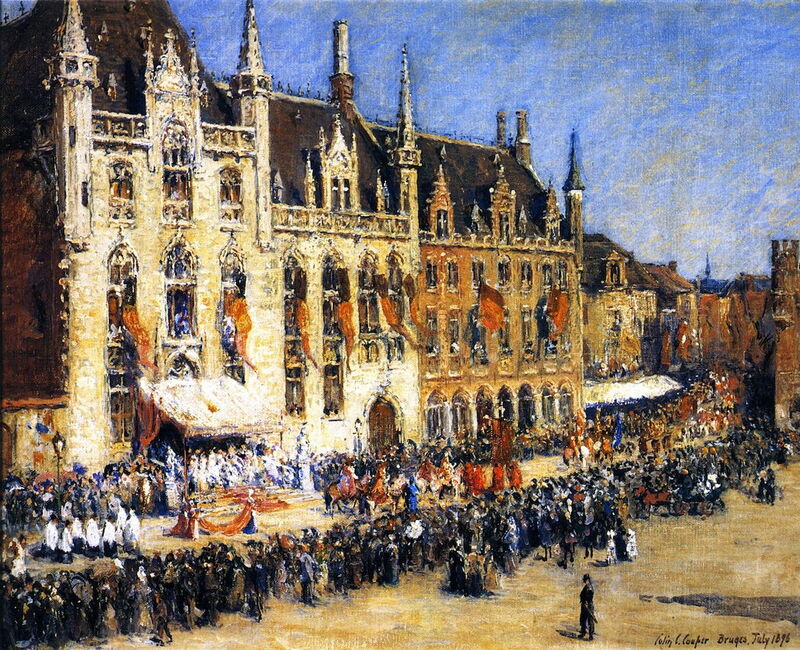 The Pageant at Bruges (1896) is an early painting combining what were to become lasting themes in Cooper’s work, with its architectural detail, rich colours, and crowds of people. This is not the famous Pageant of the Golden Tree, which has been held in Bruges every five years since 1958, but appears to have been a combined legislative and religious ceremony. He continued to visit Europe, mainly in the summer, and painted in the artists colonies of Laren and Dordrecht in the Netherlands. He married Emma Lampert (1855-1920) in her home town of Rochester, New York, in 1897, and the following year the couple set off to tour Europe again. 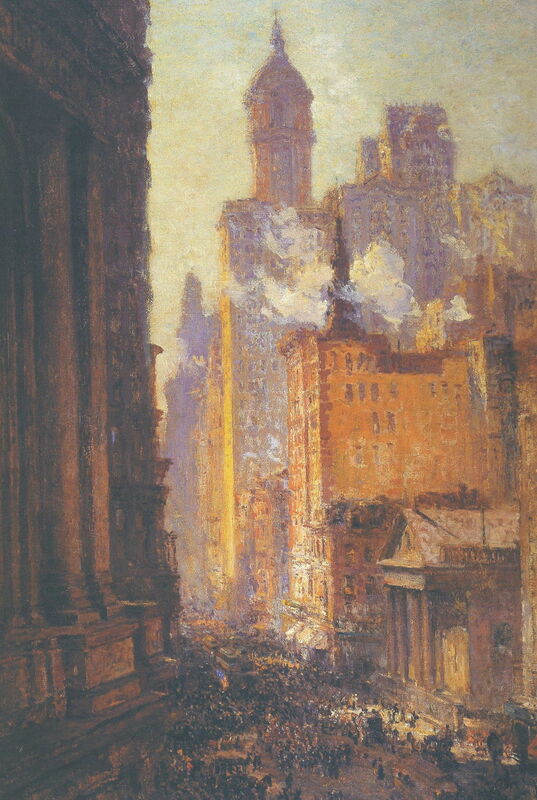 His style became more Impressionist, and in 1902 he developed a fascination for the growing skyscraper cityscapes on the East Coast of the US. In 1904, they moved to base themselves in New York City. Colin Campbell Cooper (1856–1937), The Interior of Lincoln Cathedral (c 1905), other details not known. Wikimedia Commons. 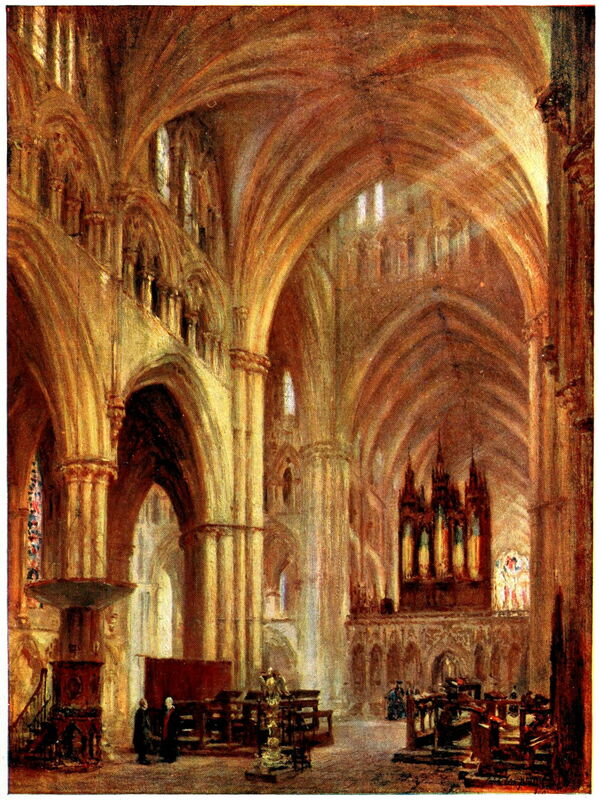 The Interior of Lincoln Cathedral (c 1905) shows the area of the organ in this English cathedral dating from 1088. The organ shown had only recently been installed by the classical organ-builder Henry Willis. Cooper captures particularly well the lofty and distinctive vaulted ceiling and incoming shafts of light. 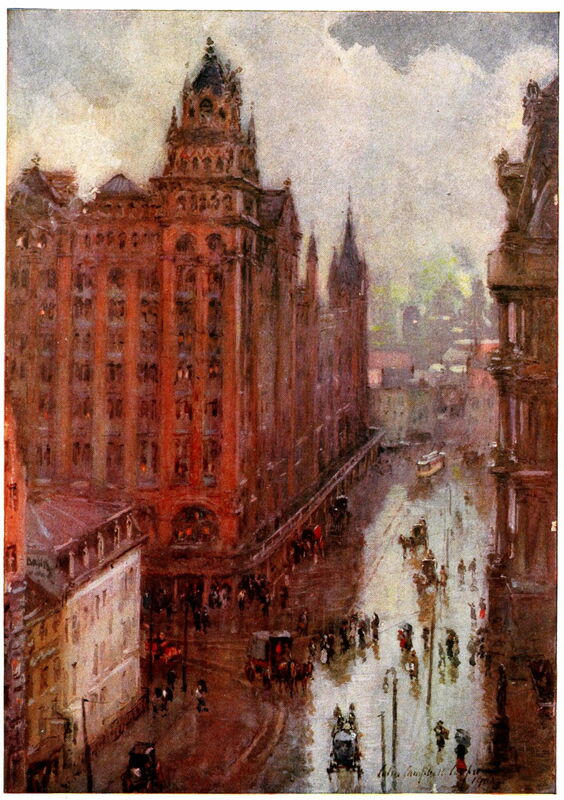 Broad Street Station, Philadelphia, in the Rain (c 1905) is one of Cooper’s many skyscraper paintings, which he started creating in about 1902. This station, at Broad and Market Streets, was the primary passenger terminal for the Pennsylvania Railroad, and at the time served as its headquarters. The site is now occupied by the office towers of Penn Center. This painting is a good example of Cooper’s exploration of colour and light in America’s increasingly vertical cityscapes, seizing the opportunity of a wet day for the brightness and complexity of the reflections from the street. 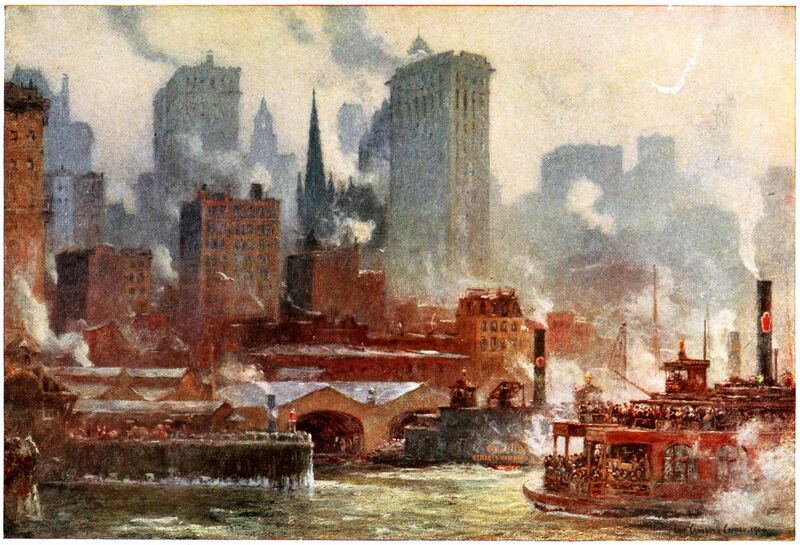 The Ferries, New York (c 1905) is a superb study of the dense crush of people on the ferries, the waterside warehouses, and the abundant smoke and steam among the higher buildings in the background. Flatiron Building, Manhattan (c 1908) is an important painting in many ways. It was one of the few made by Cooper using casein paints, which had come into vogue at the time. More characteristic of illustrations than fine art, Cooper shows how versatile these paints are in skilled hands. This was painted just a few years after this distinctive landmark at 175 Fifth Avenue had been completed (1902). Then one of the tallest buildings in New York City, at 20 floors high, its triangular section makes it instantly recognisable. It was originally named the Fuller Building, after George A Fuller, the ‘father of the skyscraper’, but quickly gained its more popular title. It was equally quickly photographed in classic images by Alfred Stieglitz (1903) and Edward Steichen (1904), but Cooper’s composition – with its bustle of people, carriages, and aerial wisps of steam – makes his view one of the most impressive. 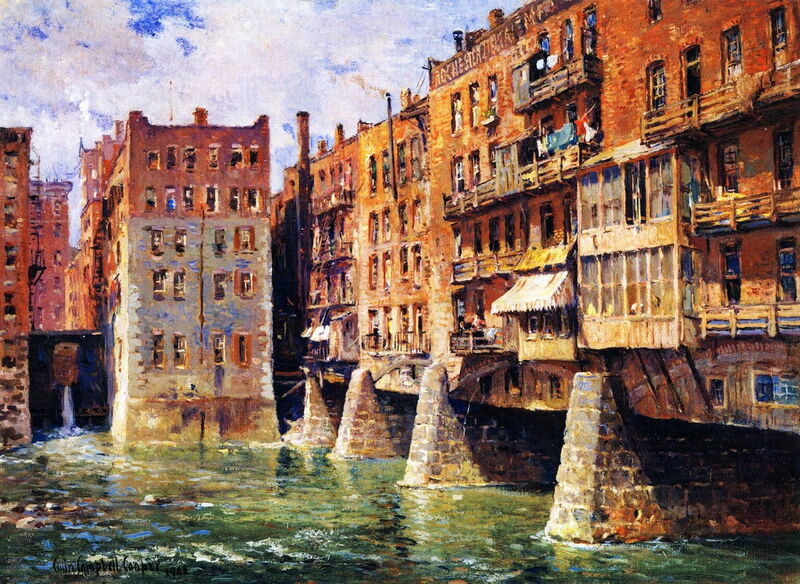 Colin Campbell Cooper (1856–1937), Main Street Bridge, Rochester (1908), oil on canvas, 66.7 x 88.9 cm, Memorial Art Gallery of the University of Rochester, Rochester, NY. Wikimedia Commons. Main Street Bridge, Rochester (1908) was a break from his steady series of skyscrapers, and shows a view which might appear more Italian than American. The original bridge at Rochester, New York, was a modest wooden structure across the Genesee River, which was replaced in 1855-7 by one with five stone arches. Buildings soon started to appear on both sides of the bridge, making it appear as if it was a backwater in Venice or Florence, perhaps. Cooper captured this unique cityscape when the buildings had been completed, and before they were removed during the 1960s. Back in New York City, Cooper’s Broadway from the Post Office (Wall Street) (c 1909) is another of his most famous skyscraper cityscapes, showing the Singer Building or Tower, at Liberty Street and Broadway, which had only just been completed, and was still the tallest building in the world. Below in Broadway itself the street is packed with people. The golden light on the walls of the buildings is particularly strong, and clouds of steam enhance its effect. The Singer Building, then the headquarters of the Singer Manufacturing Company, was demolished in 1968, and replaced by 1 Liberty Plaza. Colin Campbell Cooper (1856–1937), Columbus Circle (1909), oil on canvas, 66 × 91.4 cm, Allentown Art Museum, Allentown, PA. Wikimedia Commons. Columbus Circle (1909), also set in New York City, is less about the vertical, and more the interaction of jumbled buildings, light, smoke, and steam. With Gaetano Russo’s landmark statue of Christopher Columbus just to the right of centre, the circle had only been completed in 1905, as part of Frederick Law Olmsted’s vision for Central Park, which is nowhere to be seen in Cooper’s view, as it is off to the right. In the foreground, he shows some of the more intimate sights of this new elevated world, with a woman hanging out her washing amid the chimneys. New York from Brooklyn (c 1910) shows the busy piers of Brooklyn still operating as the major gateway into the East Coast, and the ultimate collection of skyscrapers, most of which had only recently been completed. The colour contrast between the pale gold faces in sunlight and the almost purple of cast shadow is characteristic of Cooper’s style. 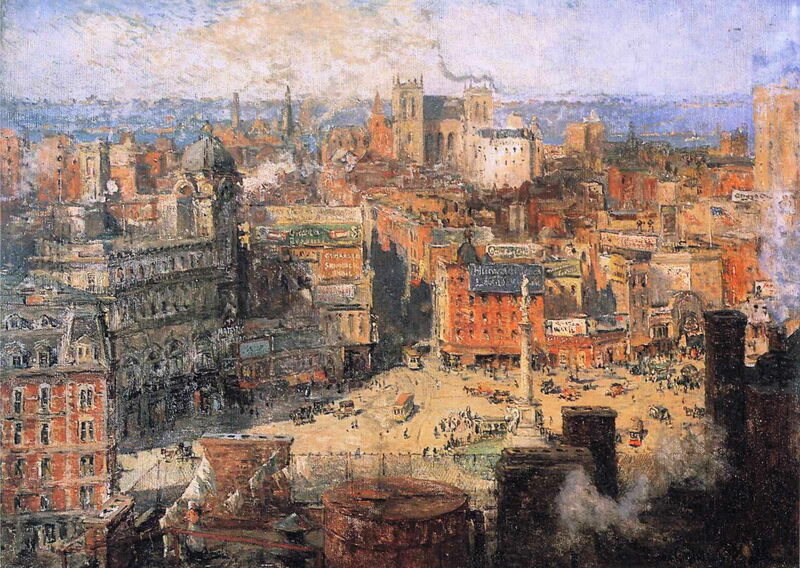 Posted in General, Painting and tagged America, cityscape, Cooper, Impressionism, Lampert, skyscraper. Bookmark the permalink.